One of the central issues in the future of voting rights is voter turnout, especially when considering the disparity among different ages and ethnicities. The charts below illustrate the voter turnout trends over recent decades in presidential elections. While there are some encouraging signs of increased turnout at times, there is abundant space for achieving greater turnout for elections across all groups of people. Despite some recent gains, the overall turnout in presidential elections seems to have plateaued somewhere between 50 and 60 percent. 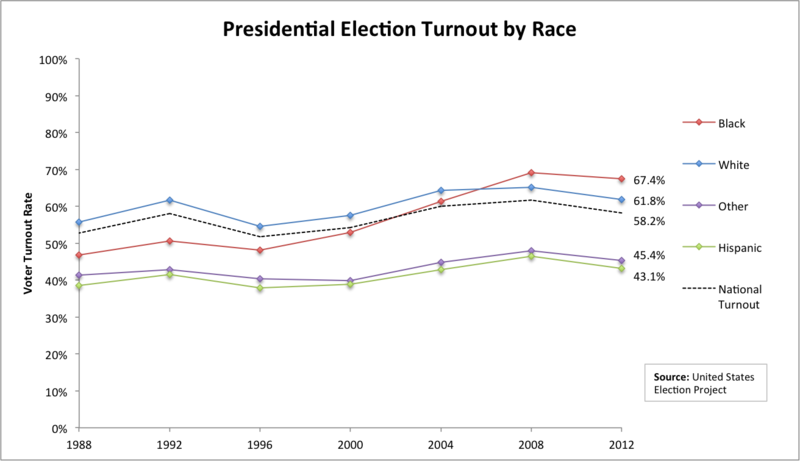 Only two elections (2004 and 2008) had turnout over 60%, and non-white voters are often below this threshold. Black voters have made strong strides over the past decade to surpass white voters in presidential elections, however. The rise of Black electoral participation stems from the Voting Rights Act of 1965, which has enabled voter registration and access to the polls for millions of ethnic and language minorities. The relatively low voter turnout among Hispanic, or Latinx voters combined with the rapid demographic growth of this community underscores why this group is looked toward as especially important to engage in the electoral process. If the Latinx community votes at the national rate, millions of additional ballots would be cast. The disparities shown in the current turnout rates highlight areas that need additional outreach and engagement. One of the persisting truths of elections is that older people participate at greater rates. The chart above illustrates this point clearly, showing that young people are far less likely to vote than the rest of the population. 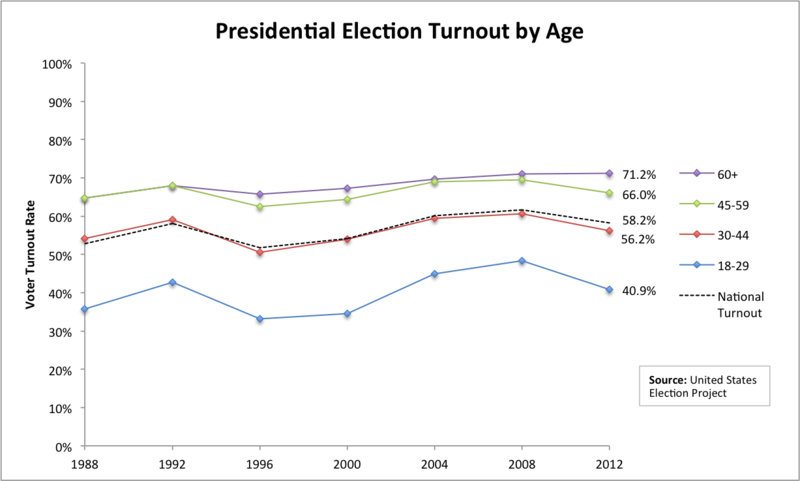 The 26th Amendment gave 18-year olds the right to vote in 1971, yet participation still lags at younger ages. While young people often have challenges to voting such as registration, relocating and little experience, there is definitely room to significantly increase participation. Influence from peers and teachers is one great way for young people to form a habit of voting, which can then last a lifetime. 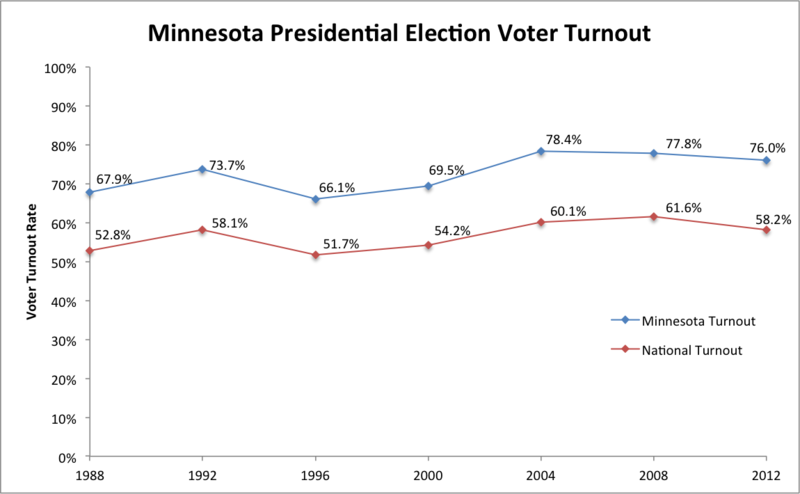 Minnesota has historically led the nation in voter turnout. As seen in the chart above, the state consistently exceeds national turnout in presidential elections by 15 percentage points or more. However, there is still room to improve. Reaching lower turnout groups such as young people and language minorities is essential to raising Minnesota’s voter turnout. Secretary of State Steve Simon has presented many initiatives for the 2016 Election in order to address these areas of need and more. Combining demographic voter turnout data and party preference information allows preliminary predictions for the 2016 presidential election to be made. Two online tools let you adjust the turnout level for various ethnic groups and assign the level of party affiliation within each group. Starting from a baseline of the 2012 election results and taking into account the population of each group, these tools illustrate the power of voting turnout in determining outcomes.